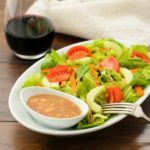 A recipe for an Asian or Thai style peanut dressing for salads. It is made with peanut butter, soy sauce, sesame oil, fresh ginger, garlic, and rice vinegar. Transfer to a salad dressing serving container.